Commissioned by a client who was now residing in a house shared with people of various ages and lifestyles, the client chose to install the art not in his private room, as others in his situation had done, but above the home's front door and thus offer the Door Protector’s blessings and benefits to everyone. Amazingly enough, his largess came in handy. As soon as the art was installed, we all realized that the sacred art was there to protect him most, yet help the others as well in amazing ways! 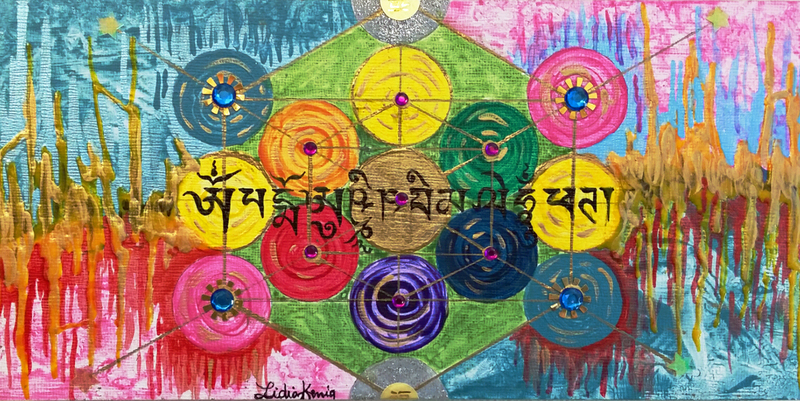 By his request, and in addition to the Wish Fulfilling mantra I write in Tibetan, archangel Metatron's Cube was included. The art became one powerful force of good. The cube represents all of the geometric shapes in God's creation and all that God creates. The Wish Fulfilling Mantra is said to fiercely protect even from the possibility of an unlucky rebirth!!! Only 8 blessed canvas-wrapped and ready to hang prints and 7 also blessed archival paper prints are available for purchase. Please check out the information available in the Purchase Info menu, and contact me to inquire about ordering your personalized Door Protector, available in a variety of sizes to fit any door situation, or obtaining a Gift Certificate. Prints make great gifts!